I've been thinking about rich console applications, the kind of apps that can display things graphically, not just appending lines at the end. Here are some info, enough parts to be able to write Tetris. To display some text at an arbitrary location on a termial screen, we first need to understand what a terminal actually is. In the middle of 1960s, companies started selling minicomputers such as PDP-8, and later PDP-11 and VAX-11. These were of a size of a refrigerator, purchased by "computer labs", and ran operating systems like RT-11 and the original UNIX system that supported up many simultaneous users (12 ~ hundreds?). The users connected to a minicomputer using a physical terminal that looks like a monochrome screen and a keyboard. The classic terminal is VT100 that was introduced in 1978 by DEC.
VT100 supports 80x24 characters, and it was one of the first terminals to adopt ANSI X3.64 standard for cursor control. In other words, programs can output a character sequence to move the cursor around and display text at an aribitrary location. Modern terminal apps are sometimes called terminal emulators because they emulate the behavior of terminals such as VT100. This is a useful control sequence to implement a progress bar. These can be used to save and restore the current cursor position. Using this sequence, we can change the color of the text. For example, 36 is Foreground Cyan, 1 is Bold, and 0 is reset to default. Let's say you want to take over the bottom half of the screen, but let the top half be used for scrolling text. Scroll Up sequence can be used to shift the text position upwards. On JVM, there's a library called Jansi that provides support for ANSI X3.64 control sequences. When some of the sequences are not available on Windows, it uses system API calls to emulate it. Here's how we can write the cursor position example using Jansi. Another innovation of VT100 was adding custom characters for box drawing. Today, they are part of Unicode box-drawing symbols. Here's a small app that draws a box and a Tetris block. A minor annoyance with Jansi is that if you want to compose the drawings, we need to keep passing the Ansi object arround in the correct order. This can be solved quickly using State datatype. Since the name State might get confusing with game's state, I am going to call it BuilderHelper. All I am doing is here is avoiding creation of b0, b1, b2 etc, so if this code is confusing you don't have to use BuilderHelper. Thus far we've looked at control sequences sent by the program, but the same protocol can be used by the terminal to talk to the program via the keyboard. Under ANSI X3.64 compatible mode, the arrow keys on VT100 sent CUU (Cursor Up), CUD (Cursor Down), CUF (Cursor Forward), and CUB (Cursor Back) respectively. This behavior remains the same for terminal emulators such as iTerm2. In other words, when you hit Left arrow key ESC + "[D", or "\u001B[D", is sent to the standard input. We can read bytes off of the standard input one by one and try to parse the control sequence. This is not that bad for simple games, but it could get more tricky if the combination gets more advanced, or we if start to take Windows terminals into consideration. On JVM, there's JLine2 that implements a concept called KeyMap. KeyMap maps a sequence of bytes into an Operation. I kind of like the raw simplicity of reading from System.in, but the JLine2 looks a bit more cleaned up, so it's up whatever you are more confortable with. What System.in code makes it clear is that waiting for keyboard input is equivalent of reading from a file. Another observation is that the most of the microseconds will be spent waiting for the user. So what we want to do, is grab user inputs in the background, and when we are ready periodically pick them up, and handle them. We can do this by writing the keypress events into Apache Kafka. Haha, I am just kidding. Except, not completely. Kafka is a log system that programs can write events into, and other programs can read off of it when they want to. To spawn a new thread, I am using scala.concurrent.Future with the default global execution context. It blocks for user input, and then appends the key press into a ArrayBlockingQueue. Let's see if we can combine this with the Scroll Up technique. Here, I am outputing a log every second at (1, 5) after scrolling the text upwards. This should retain all the logs in scroll buffer since I am not overwriting them. I am sure that are lots of other techniques like that using ANSI control sequences. I've used Java libraries like Jansi and JLine2, but there's nothing JVM or library dependent things in what I've shown. In particular, the Console was lacking many features expected of modern *NIX compatible systems, such as the ability to parse & render ANSI/VT sequences used extensively in the *NIX world for rendering rich, colorful text and text-based UI's. What, then, would be the point of building WSL if the user would not be able to see and use Linux tools correctly? So, in 2014, a new, small, team was formed, charged with the task of unravelling, understanding, and improving the Console code-base … which by this time was ~28 years old - older than the developers working on it! It seems like Console on Windows 10 are now compatible with VT100 control sequences, which also explains that we've been using Microsoft's page as a reference guide. The foundation of rich console application is based on physical terminal machines like VT100 from the 1970s, and ANSI X3.64 control sequences that standarized the byte sequence to control the cursor, text formats, etc. Modern terminal applications emulate the behaviors of these terminals. 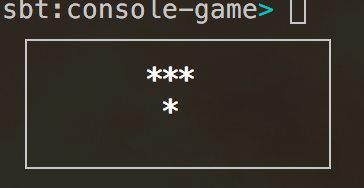 Thus, if we can assume a good terminal app, all we need is an ability to println(...) the control sequences and listen for the standard input to write a rich console app. This should be possible in almost any programming language. Libraries like JAnsi and JLine2 make some code nicer to read/write. In addition, they would provide fallback on Windows, but I am not sure how well it works on either modern Windows 10 vs older ones. The code example used in this post is availble at https://github.com/eed3si9n/console-game.